So my wish remains unfulfilled. Largely. Except for a couple of folks. But even with them it never happens like it did for my Mother. Every afternoon Ma would change into a crisp cotton saree for summer or a rustling silk for the winters.She would dab some of the Mysore sandal talc on her nose, tie up her long black hair in a plait and then put a kettle of water to boil. Some days a neighborhood aunt would drop by. On others Ma would go over. They would share stories over those cups of hot chai which I was not privy to. "Ja porashuno korte bos (go, get along with your studies)" was what they said if I lingered longer. Naturally I nurtured a secret hope of such evenings, maybe even grander ones, once I was in charge.It is yet to happen. So when this thing--- that I have been desperate to tell you all along--- happened I wanted to sit right besides you, feet tucked under my pajamas,a cup of tea in hand. And no it is not what you are thinking. No. Not at all. Okay, what are you thinking anyway ? But I am eternally grateful to you for what happened. For your kind words, for your belief in me, for reading me, for telling me that you liked what I wrote. This wouldn't have been possible without you. For like you, a very nice editor from Harper Collins (India) read my blog. And last year around summer she sent me a polite mail asking if I would be interested in writing a book. First I gulped and then decided it was one of those spams like the Nigerian government promising to transfer billions to my account. Turned out it wasn't. This was really, truly, a real life editor from Harper. 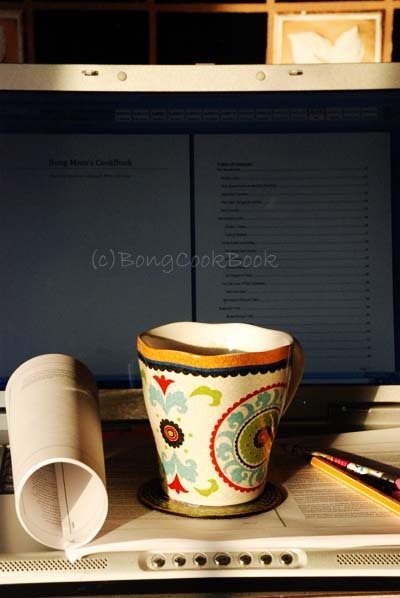 She wanted me to write a book based on my blog, a food narrative along with my recipes. I was so struck by the wondrous nature of the whole thing that I of course said "Yes". Only a month later I realized what I had done but by then the contract was signed. The deal was sealed. And I was going to write a book. THE BOOK. 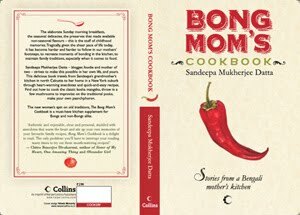 The Bong Mom's Cookbook. So I have been writing a book. It has been nine months. Given that number I now treat it like a third child in my womb. I have been putting my everything into it. My love, my emotions, my thoughts, my life. In fact I am so attached to it that I am having separation anxiety and am yet to hand over the manuscript. 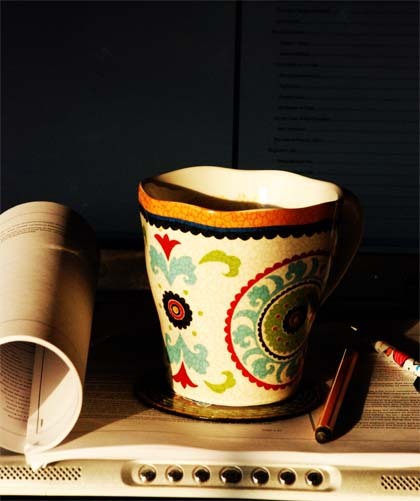 Every day when my girls are finally in bed, the dishwasher is humming a Dadra, the crickets outside have given up chirping, I sit on the black poang, open up MS Word and pour my heart into it. I am also dead scared (very unlike a third time new Mother is wont to be) and that is the reason I had kept it in my heart though my mind itched to share it with you long back. But now I need your support, your trust in me, your wishes and your blessings. Send me all your good vibes so that I can do my best. Please, pretty please.Else my toes are going to curl up cold and the gestation stage might get longer than that of an elephant. What is it about : More of a Food narrative than a cookbook per se. In short mine, yours and everyone else's life in food with recipes thrown in. More details as I write the book. Now that you guys are in the loop trust me you are going to hear of my third baby as much as you do about Big Sis and Li'l Sis. And then don't come back and tell me that irritates the heck out of you. There's an whole army of talented bloggers whom I owe big time for this whole blog thing. Almost all of them are on my reader you see on the left. Thanks Miri, Mandira, Manisha, Indo of Daily Musings, Sra, Vani, Nupur of One Hot Stove, Mallika, Happy Cook, Cham, Sig, Sailu, Anita, Linda, Jaya of DesiSoccerMom, Supriya, Jaya of Spice and Curry, Soma, Pree, Sharmila, Eve's Lungs and Kalyan for being there and sharing your food. 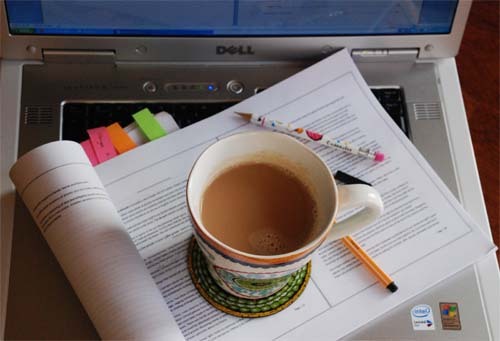 And Cynthia I owe you big time for helping me through the jargon of the contract language.Then there are those who do not blog anymore but had set up the path like Indira of Mahanadi, Inji, Asha, Mallu Girl, Sunita and Vee. I think half of my book is going to be just Acknowledgments. "Pancakes" it hit me. "We can do pancakes". "We can color it", said Big Sis who always tries to find an excuse to use the tiny box of food colors we had got last year and rarely used. I decided to go with one of Little Sis's book simply to get her interested. Big Sis is a voracious reader and needs no motivation. And it really did--got the little one all piqued. She diligently followed the steps needed to make a pancake from flour, to milk, to eggs, to butter and then promptly fell asleep. It was tedious if you started from the wheat bit and followed the long supply-chain involved in making a pancake. 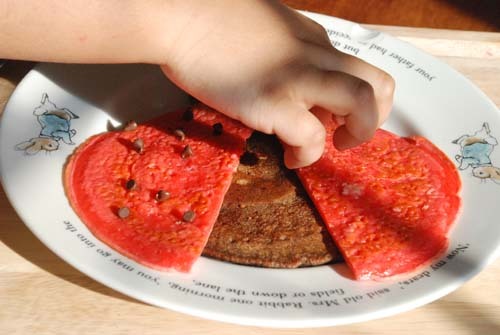 But it also gave the kids a good idea that even a simple food like pancake involves a complex process. After narrowing it down to Pancakes we decided to shape it like The Very Hungry Caterpillar because, because...ummm well we thought a caterpillar would be easy to create with pancakes. All things said and done I made this very easy and totally reliable Pancake Mix on Friday night before going to bed at 12. I like to plan my days. I am very organized that way.Not. On Saturday morning due to my superb organization skills there was crisis. We searched high and low and could not even get a whiff of The Hungry Caterpillar-- the book. Like many of Lil Sis's belongings I am sure it is tucked away somewhere to be found 1, 5 or even 10 years later. 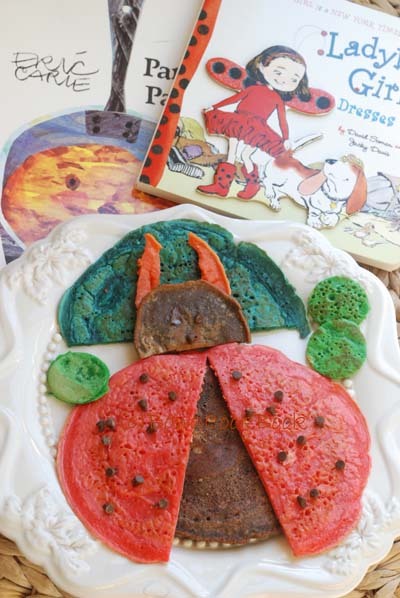 So then Big Sis suggested a LadyBug pancake based on "Ladybug Girl Dresses Up"(by Jacky Davis) another of Lil Sis's favorite books. She loves how Lulu dresses up as a pirate, an astronaut, a spy and then finally a ladybug. Since we had enough food color to paint the town a ladybug with red wings and chocolate chip dots appealed immensely to both the girls. 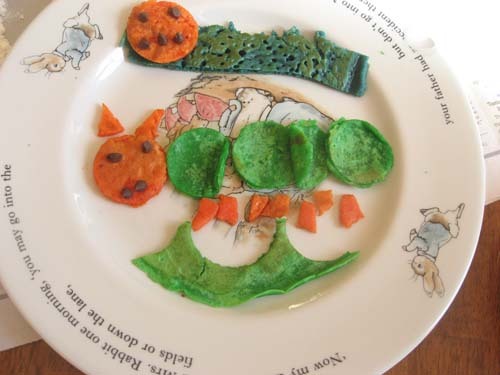 I got idea of a ladybug pancake from here (they have more lovely ideas there).The girls of course went wild with the color and added a teal blue sky, greenery around and flashy red wings with day-glo orange for the antennas. Then they added more colors and made a caterpillar. Then they added more and made stuff I did not even recognize. Finally we ate them with a good drizzle of Maple syrup. The pancakes were soft, fluffy and just right. The Pancake recipe was courtesy Nigella Lawson snagged from here. 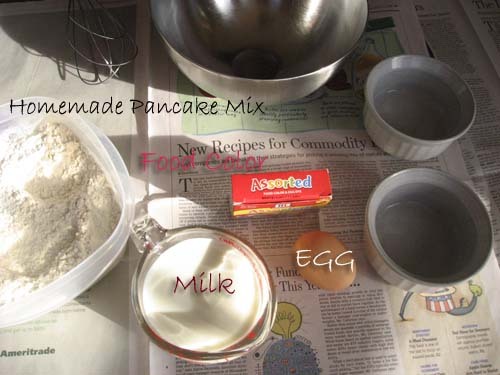 The Homemade Pancake mix is such a brilliant, brilliant idea that I have been gushing over it. You can make it ahead and store it in an air-tight box. I used it within two days but I think it will keep for a week. Oh and I also made some pancakes and froze them to be used during the week. My first time freezing them and I thought it was a pretty helpful thing to fall back on busy week days. This is my entry for edible Books going over to Play By the Book. And on the creative note do checkout the lovely Etsy store stocked with the cutest framed appliqued art work of my another favorite blogger Peppercorns in My Pocket. Mix all of the above ingredients and store in an air-tight jar or box. to about 1&1/8 cup of the dry pancake mix. Mix gently to combine. Do not overmix. Note: the recipe said to add 1 cup pancake mix but I wanted thicker American style pancakes and so added a little more. 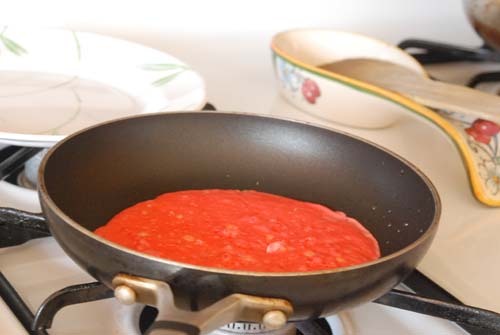 Heat a flat griddle or pan over medium-high heat. Grease with little butter or oil. Spoon 1/4 cup of batter onto the hot griddle and when bubbles appear on the surface of the little pancakes, flip them over to make them golden brown on both sides. 1/8 cup batter with orange food color from which strips were cut for antenna. Chocolate chips made the polka dots. Bengalis and only bengalis can come up with a term like "Niramish Alu Dom". 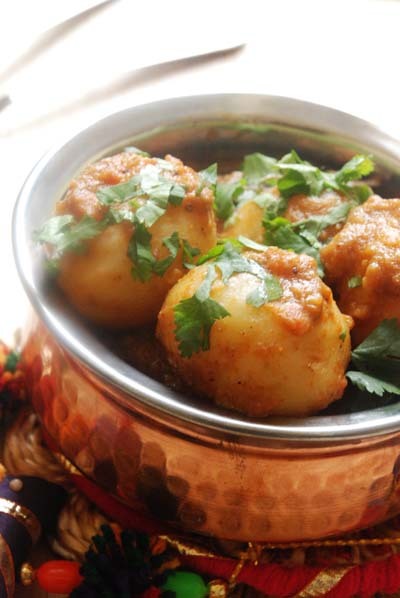 I mean isn't it plain common sense that Alu Dom IS a "niramish" aka vegetarian dish. 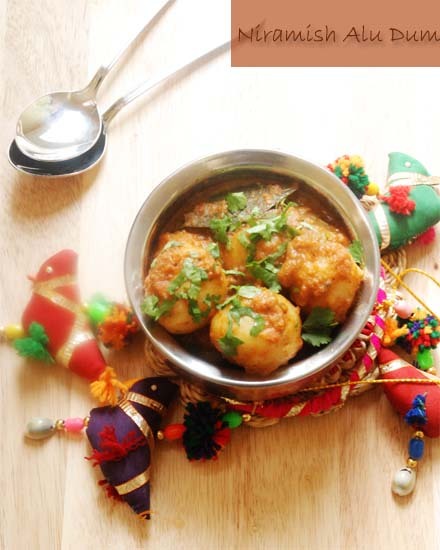 But Bongs are so fastidious about their vegetarian food that they divide it in two categories --- (1) the regular vegetarian cooked with vegetables but may contain onion and garlic and (2) the strict satvik vegetarian which uses no onion or garlic. Onion and garlic are considered as "rajasik" or "tamasik" food which increases body heat and supposedly fuels passion and ignorance. About ignorance I am ignorant but I can imagine the heights of passion that an onion-garlic breath can bring about. Passion to run away. But honestly as I said earlier if I have to choose between not shedding tears on my allium and passion, I will go with the former. I am very passionate about my comfort that way. So I was super interested in this super vegetarian alur dom that my Ma made. No onion. No garlic.The Other aloor dom on my blog does have onion after all. 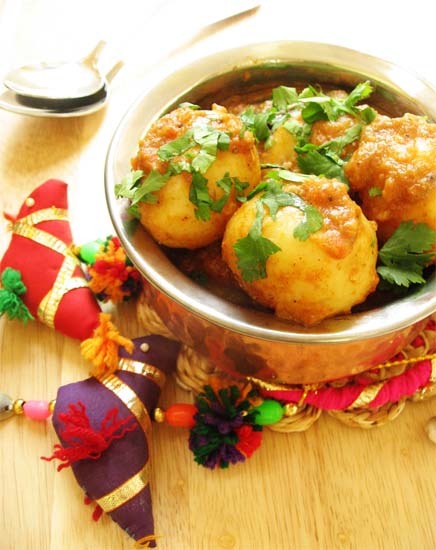 Wishing you all a Very Colorful Holi with this Alur Dom. Stay Tuned as I have something to share with you in the next post. 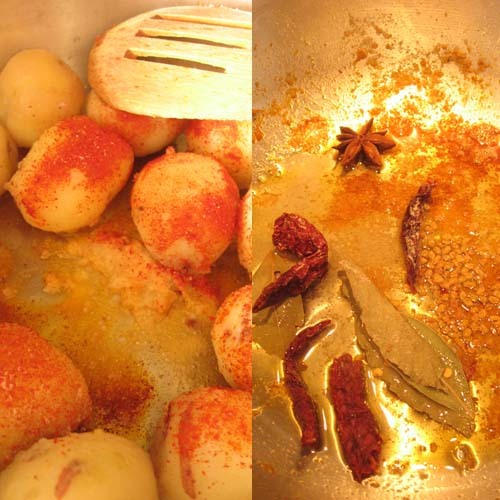 Till then "Dhoom Macha De...Raang Jama de"
Peel skin, prick the potatoes randomly and toss them with salt, 1 tsp of ginger paste and 1/2 tsp of Kashmiri Mirch and 1 tsp of garlic paste. 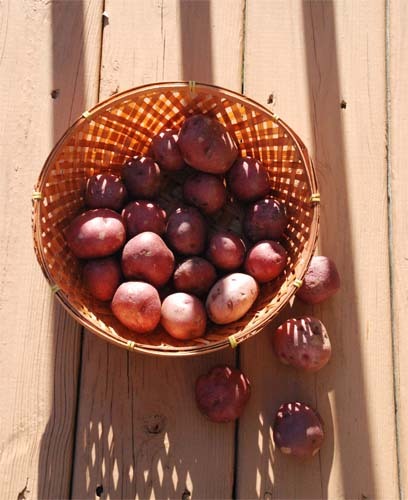 Fry the potatoes in 1 tbsp of oil till they develop gold spots. Next heat 2 tbsp of White Oil + 1/2 tsp ghee. Switch off the heat and let the oil soak in the flavor of the spices. Switch back on again. Add 2 large tomato finely chopped along with 5 green chili chopped in rounds. Or puree 2 large tomatoes with 5 green chili and add that. Fry for 6-7 minutes till the tomato is mushed up and reduced to a sorry pulp.Puree is a better option. Also little tomato paste along with fresh tomatoes works wonder.Note: I had made this alu dom very spicy, you can adjust the chili heat to suit your style. and fry for 2 more minutes. Lower heat and add the paste. Add 1/2 tsp of Red Chili powder. Fry the masala, sprinkling water as needed for couple of minutes. Add the potatoes, toss in the masala. Add about 1 cup of water, salt to taste, 1/2 tsp of sugar and simmer. 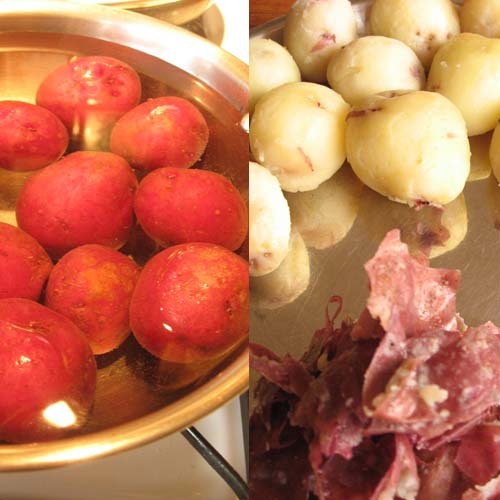 Cook covered till potatoes are done. Garnish with chopped coriander and two green chili chopped in thin rounds. Every Monday, ok most, I wake up all anew, striving to be a "Good" Mother. Not "Very Good". Not Excellent. And definitely "Not Bad". Just plain, simple "good" Like I have all along wanted to be. Good girl, good student, good whatever...an uncanny desire for goodness. Only this time it is harder than most. How do I decide how much I need to nag for Piano Practice without it falling into the category called "pushing" ? How can I make sure that I am mentally stimulating without "helicoptering"? How do I ascertain that my exasperation when a long division is messed up is not going to cause some negative setback in late fifties of my offspring ? How do I teach to be competitive without being aggressive ?What are the fine lines ? Darn there are so many that I wish someone would have highlighted them with a fluorescent marker. And then comes real incidents like this only miles away from home and I wonder what went wrong with both the kids ? The Mothers must have stayed up nights, fed vegetables, told stories, ferried to a violin class or spent hours by the hot pool. The Fathers must have done whatever he did. The schools were excellent, the Teachers good. And yet. No wonder by Thursday or even Wednesday I want to hand over the remote, a bag of chips and say "Que sera, sera". In spite of this it is a fun ride. An exciting one. I would not say I learn as the years of my parenting grows because I am not sure of that. The only thing I realize is no two child are same and there is not set rule that applies to all. Now many a Mondays when I am striving hard, I usually go on Amazon and order books for the girls. On these days I deviate from the standard fiction series that is bought otherwise. Recently I bought three books which I found so wonderful that I thought I would share with other Moms here. The first one "Children Just Like Me" was suggested by the wonderful blog of Choxbox who sadly does not blog anymore. This is a beautiful book with gorgeous pictures about children all over the world and how they live, eat, go to school etc. Very engaging way to learn about the different cultures. 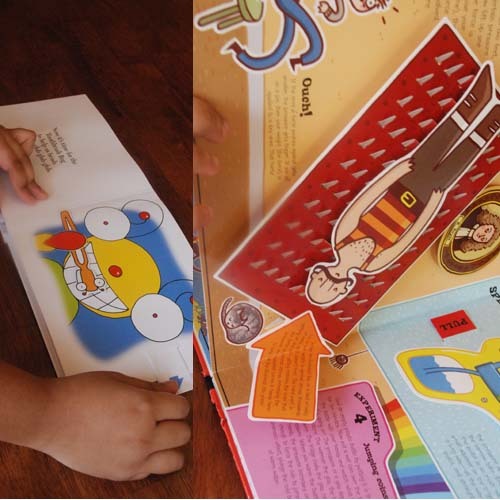 The second one "Feel the Force" is a popup book explaining basic Physics stuff like gravity, friction, force, pressure etc. It is much fun and an excellent review is here. BTW, the Mom who writes that blog is very inspiring. I love her reviews and am totally awed by the activities she does with her kids. 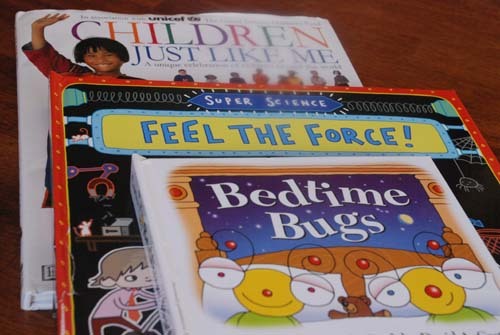 The third book "Bedtime Bugs" is a popup book for younger kids. This one I had to buy forced by Little A and it really was a good thing. If your child loves to pull tabs and pop-ups they will love this one..
Back to regular programming, lets talk food now. Today though it is just spices without which food wouldn't be what it is. 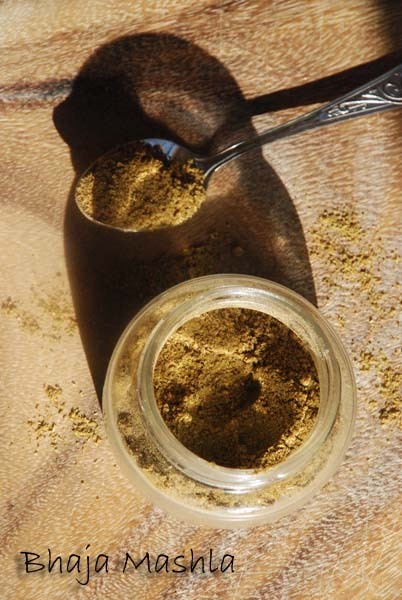 Bhaja Masla or Roasted Masala is a unique Bengali spice blend. What makes it furthermore unique is that there are several kinds of it. Some I know of. Some I have heard of. Some I have no clue about. Bhaja Masla 2 -- Dry roast Paanch Phoron and Dry Red Chili. Cool and grind to powder. I use it on chutneys. And then there is my Mother's Bhaja Masla. Her staple in her pantry. My home roasts with this flavor during her visits. 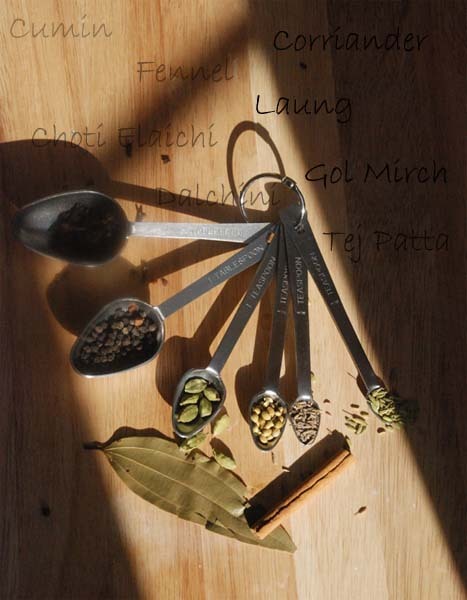 Strong, Robust, Smoky--- this masala speaks of mystery and adventure and dark chambers with hidden specters. My Ma uses it to sprinkle on chutneys, to make vegetable chops, to use in lieu of Garam Masala and to revel in it. She also makes a fabulous niramish alur dom with it which will come up next. Roast for 8-10 minutes at very low heat till you get a strong spice smell. Cool and grind to a fine powder. This measure makes a large amount of powder which can be stored for later use. 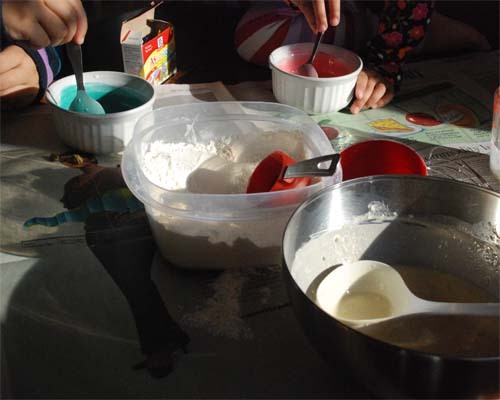 You can make smaller amounts by using quarter of the measure.